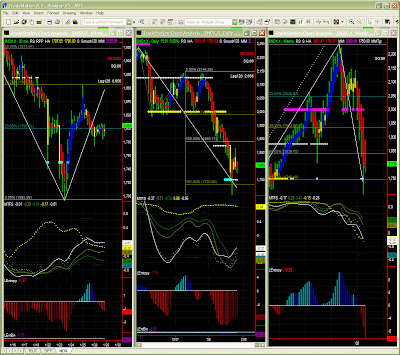 Position (daily): flat for most, long entry (since last post) in shorter time frames. Last time, i mentioned that contrarian traders would have been long. The 60mins scenario happened exactly as anticipated. It pays off to be early, it depends however on the investment horizon and the long term outlook is not great. The sudden rate cut, a bit of short-squeeze maybe, managed to calm bears down for now. For the time being, Entropy and MTFS are not indicating much of a direction. SPY could well reach MM pivot level, up to maybe a Fib target. We have the FOMC meeting coming, so it is understandable that visibility or market readability becomes a little more fuzzy. Entropy is slowly picking up, but after a (too) early MTFS lines crossover, it is unlikely any strong recovery can happen in the coming day. Of course, we have no crystal ball and another significant rate cut could certainly change the market dynamics, We'll watch carefully the Fib retracement levels on the way up. NB: the Swing indicator is now up but is not in stable condition just yet. MTFS and Entropy do still point downward, but EntBin is only -1 and MTFS significance level is quite low. 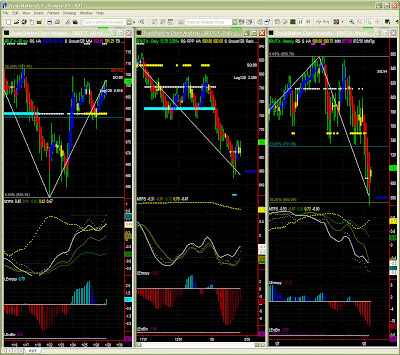 No rejoicing however, we have to wait Entropy to bottom out, MTFS to look better and the end of the series of red bars. Not sure when this will happen, but a recovery is possible (MTFS white line turning up in oversold territory, and Entropy bottoming). Again MTFS lines gradients do not indicate a return to the bull market though.